What is your favorite road? Most riders have a favorite road or type of roads, the place where the rider + motorcycle + road combination provides the best riding experience. It could be a favorite road because of where it is, or because of the landscape, ocean, mountains, deserts in the area where the road goes by. It could be because of the road’s destination. 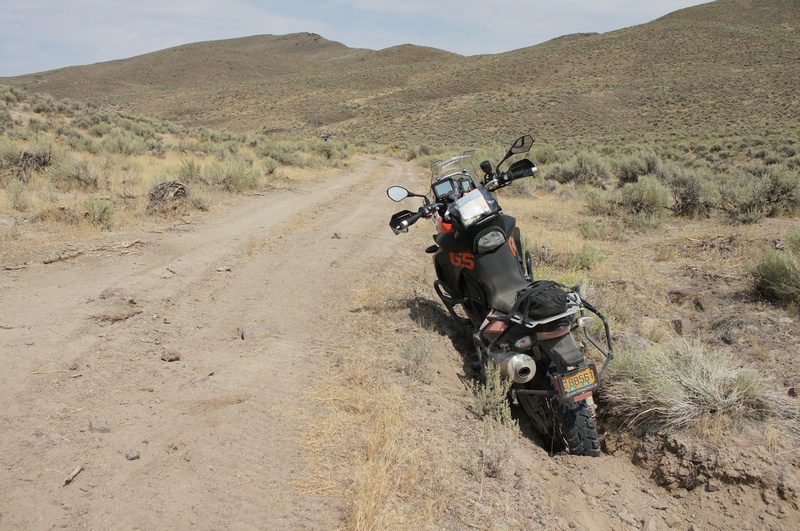 It could be about how the motorcycle handles this road, or how one rides the motorcycle when on this road. It could be about memories it brings when riding this road, or what and how the road inspires the rider, it could be the smells of the vegetation along the road. I would never be able to come up with a complete list. Each rider has their own reasons and explanations. And I bet each one will have multiple favorites, one for each motorcycle they’ve ridden, because depending on what makes it a nice experience may change from motorcycle to motorcycle. 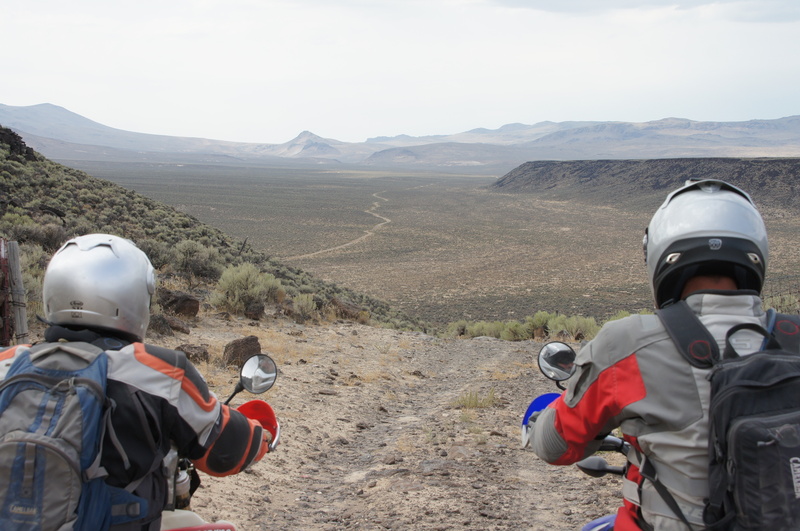 There are riders who will not tell you about that one great road they really like. Or they will ask you to swear secrecy before they tell you about it. There are good reasons not to advertise a favorite road or loop. 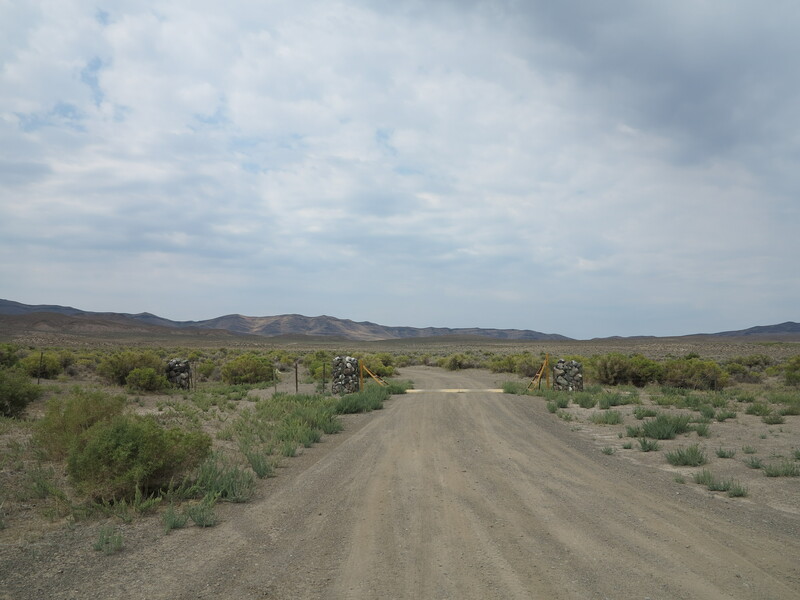 If it happens to be a dirt road on private property then a possible increase in traffic may get a road closed by the farmers or ranchers if the increased traffic disrupts their operations – what if someone leaves a gate open, for example. After a few of those cases there will be a lock on that gate, end of story for that road. 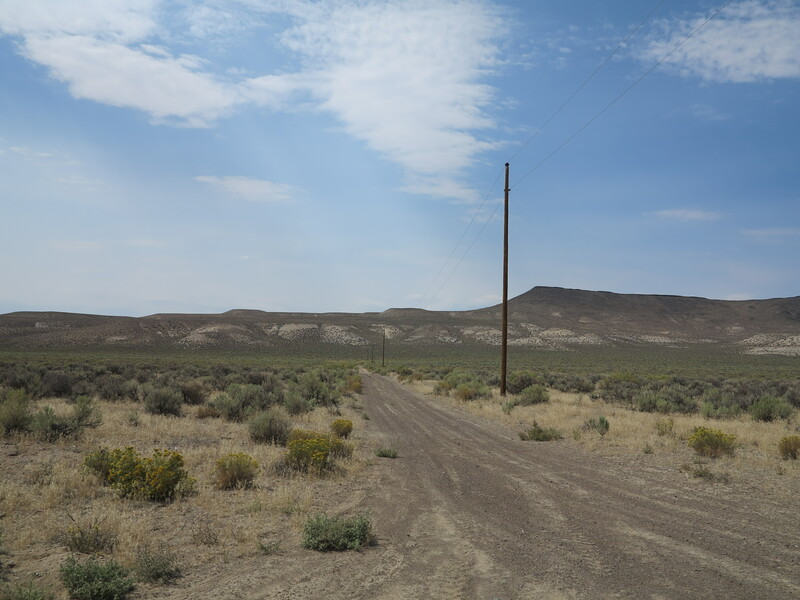 If it is on public dirt roads, its popularity could call the attention of the environmentalists, it gives them ammunition to propose road closures. In case of paved routes, more traffic may be awarded by speed enforcement by traffic authorities, for example. Or you do not want to see too much traffic, and weekend warriors, on your favorite road. Or you simply do not want disruptions when you are on your favorite meditation grounds. 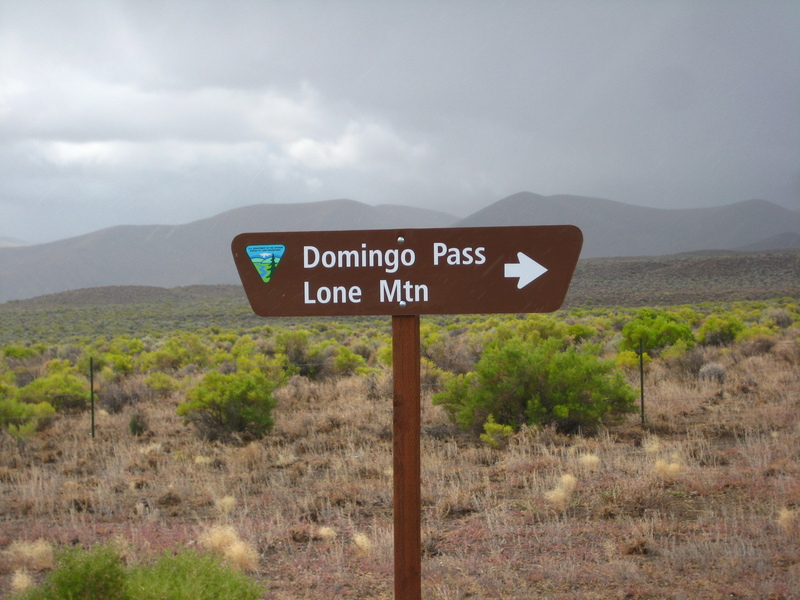 Domingo Pass, the start of the Lone Mountain Loop. 2010 Edition. Having said all of that, I will tell you about this road, actually a set of roads that compose a loop, my favorite dirt roads loop. I call it the Lone Mountain Loop. Because it is on a remote area and I have a limited number of readers who live in this region, I disclose to you this 100 mile loop in the hopes it will not bring hordes of riders to have a go at it. Looking east, from the top of the Domingo Pass. 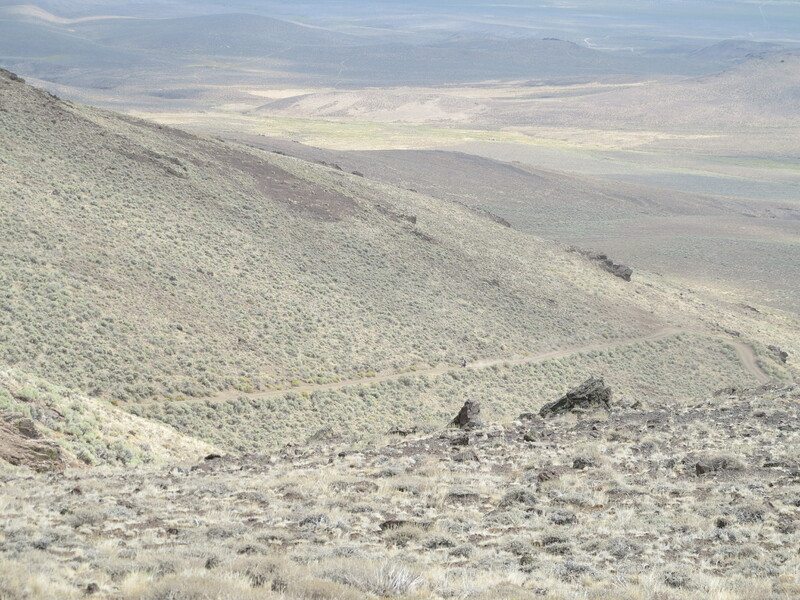 Lone Mountain Loop, 2010 edition. For as long as I live in Oregon and ride adventure bikes, I plan to visit this loop every so often. I need to travel more than 300 miles to get there, but it is worth it. Getting there is part of the fun. Actually, the simple fact that it is that far away, not too far, not too close, and the many places I have to go through to get there, makes it even better or more special. A three-day weekend takes me there. One day to get there, one day to ride the loop, one day to ride back home. 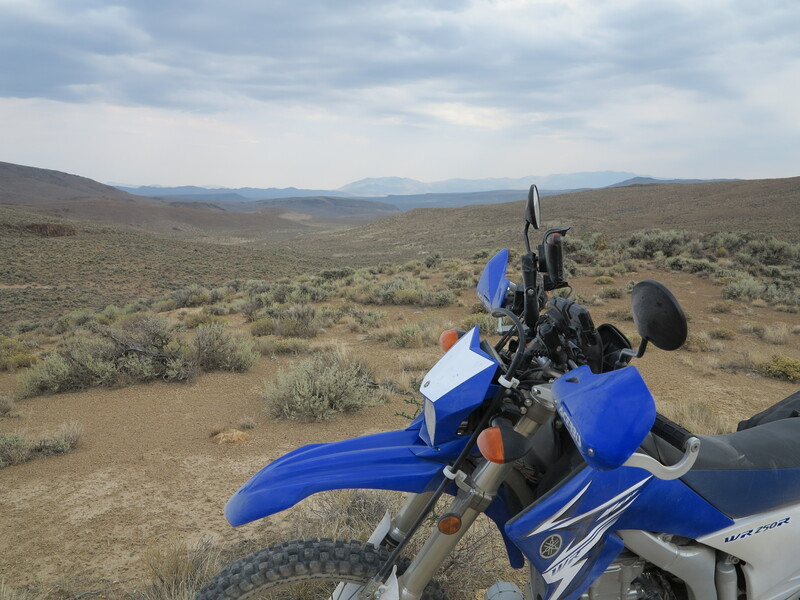 Starting early in the morning, I think I could actually do two loops in one day – the Trout Creek Mt. Loop and the Lone Mt. Loop, which together can be done as a figure 8. But that will be another story, something for next year’s labor day weekend, perhaps. 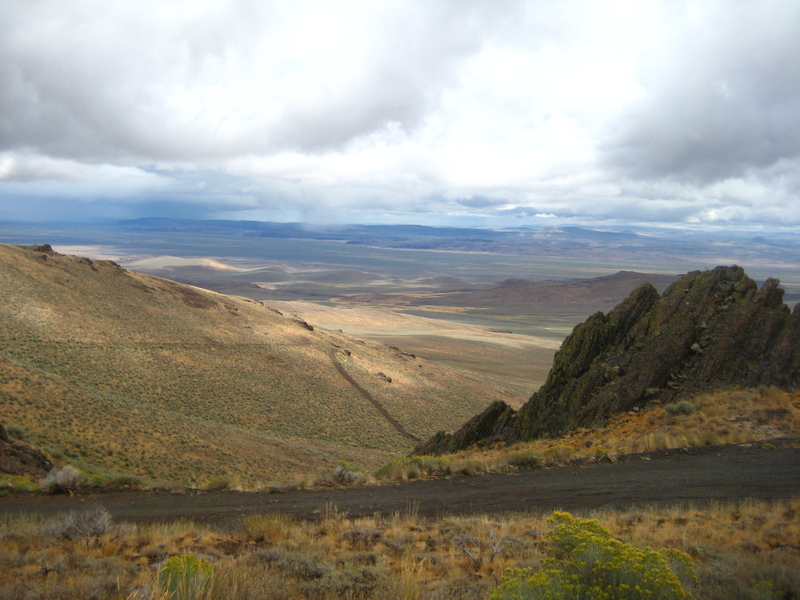 In 2010, the last time I was on the Steens Mountain area, Doug and I and all the others who were with us on that trip, had agreed to go on the Lone Mountain Loop. 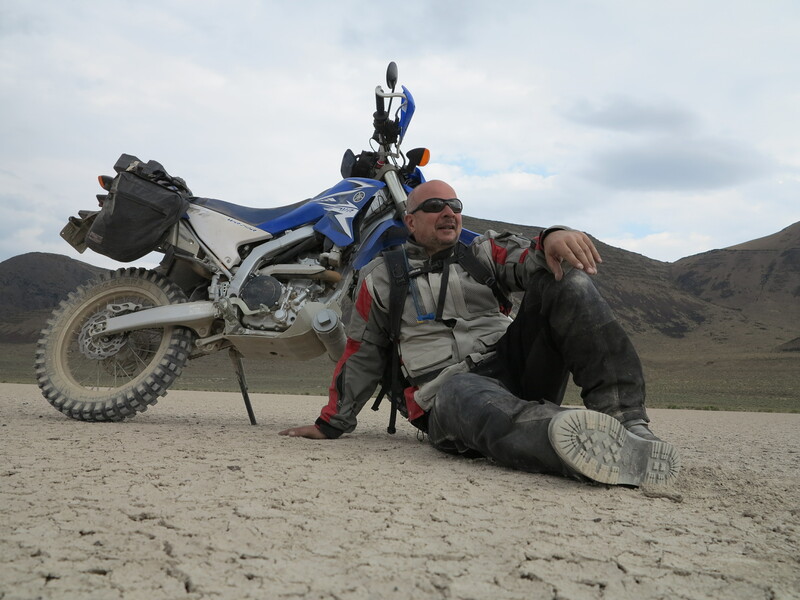 Doug is a very easy-going guy, ready to ride any challenging road. But the tables turn very quickly when he hears about rain. He starts talking about flash floods, mud, he wants to run away from the rain (and in most cases he would be right for playing safe and staying away from these situations). 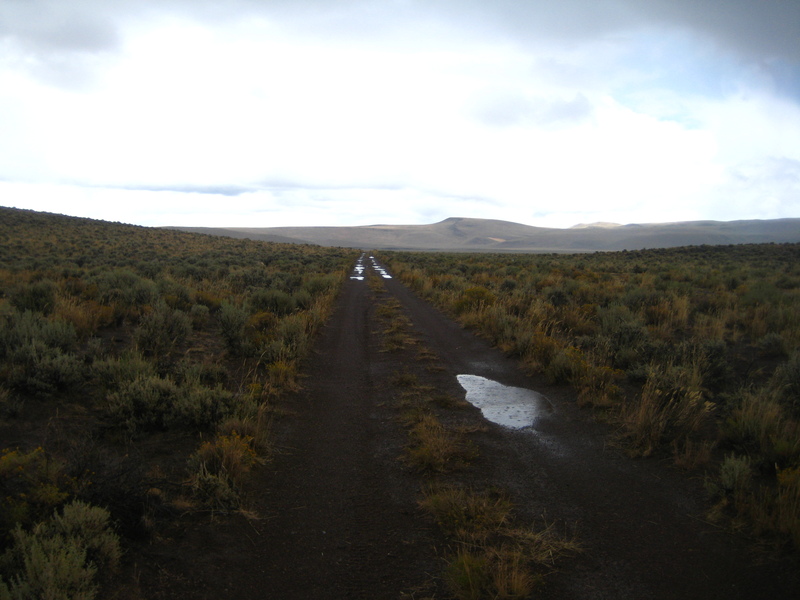 In September 2010, the day we were supposed to get on the Lone Mountain Loop, it rained, and it rained a lot in that morning. I remember that day as if it were yesterday, the treacherous ride, the 50 miles from our campground in Page Springs (Frenchglen) to Fields, a stage point for the loop. We traveled those 50 miles on the paved Hwy 205 under pouring rain. Once we got to fields the rain had subsided. 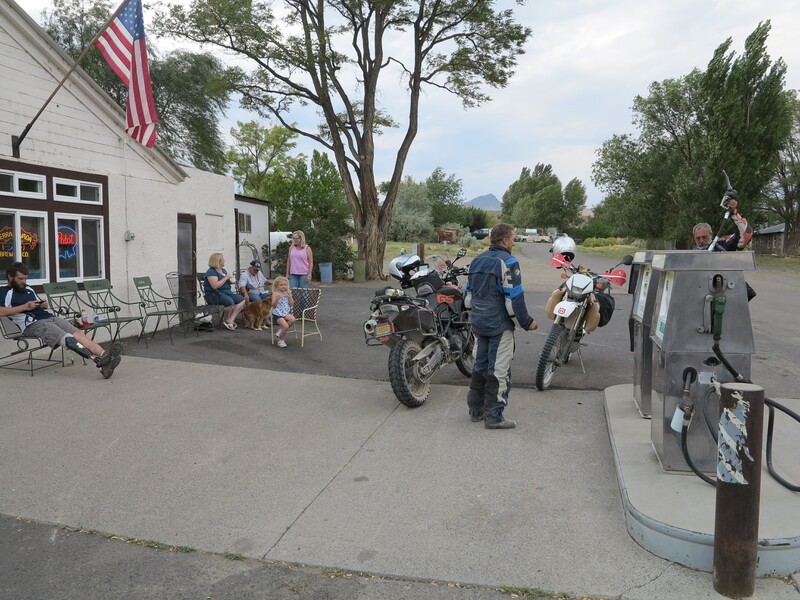 But Doug and everyone else in the group had settled in the Fields Station restaurant, some of the riders in the group had gotten wet on the way there. They decided not to go on the loop. I argued with them… in September, after the summer months with zero rain in the desert, this first rain in the fall would not be enough to turn dirt into mud. And if it would flood, it would be in lower areas, we could wait for the water to go down or turn back if possible. We wouldn’t drawn, I argued, and at the most we would get wet and would have to be patient, I insisted. As you can tell from pictures I’ve been sharing, 2010 was not my first time on this loop. I had done it in 2006 in my BMW Dakar, and that’s when I realized the much fun I could have when riding my motorcycle on these roads. 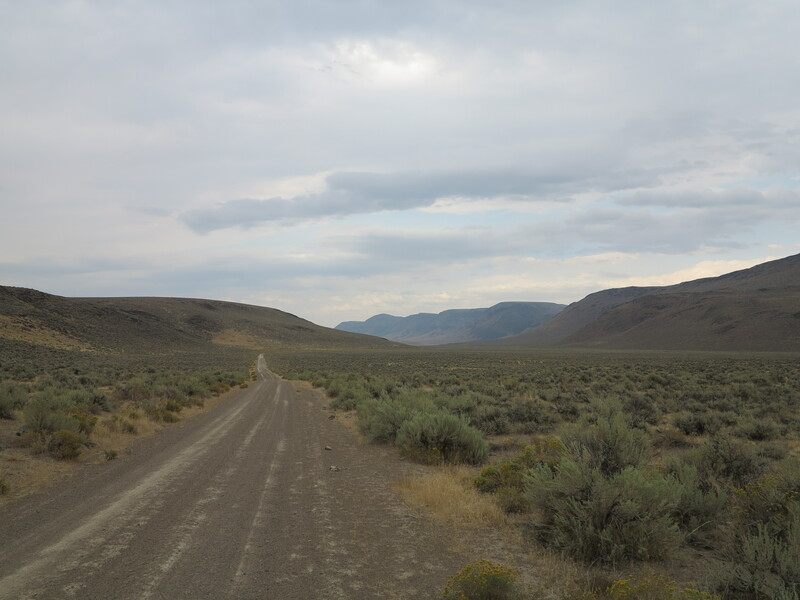 The best part of the loop, what makes it really especial, are the roads in the Long Draw, the Hawks Valley, Funnel Canyon, and the opening of the Catlow Valley, all of these roads and sequence of valleys happen when traveling from south to north. That’s what I did in 2006 when I rode in this area for the first time. 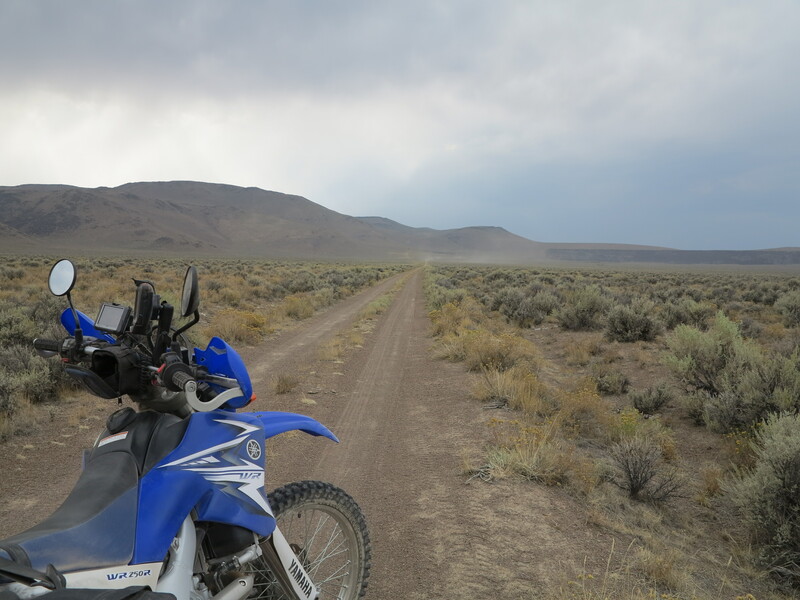 I was in awe of the beauty of the geography, the solitude of the area, and how nice the roads are for spirited riding. The perfect storm. 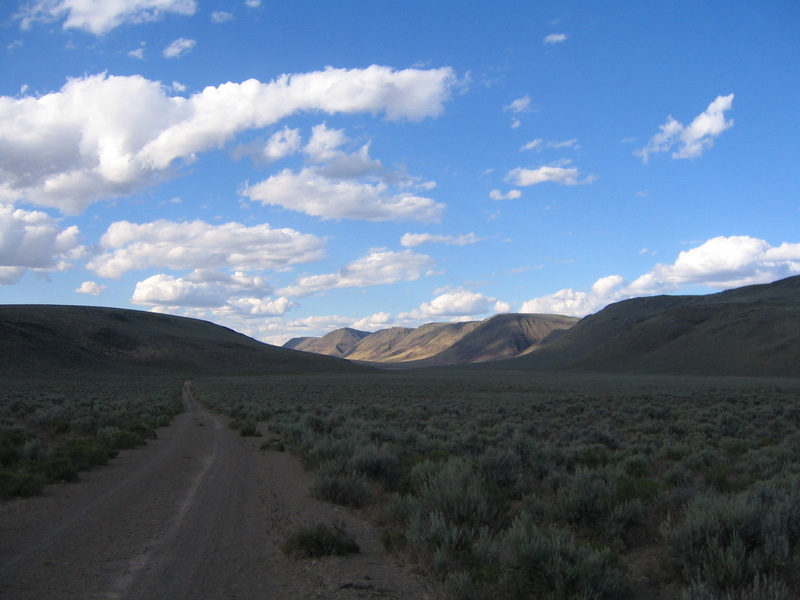 Playa in the south end of the Catlow Valley, Lone Mt Loop, 2006. Talking about storms, let’s go back to the Fall of 2010, when we huddled in the Fields Station, everyone intimidated by the rain, and I failed to convince anyone to join me in the loop after the rain. 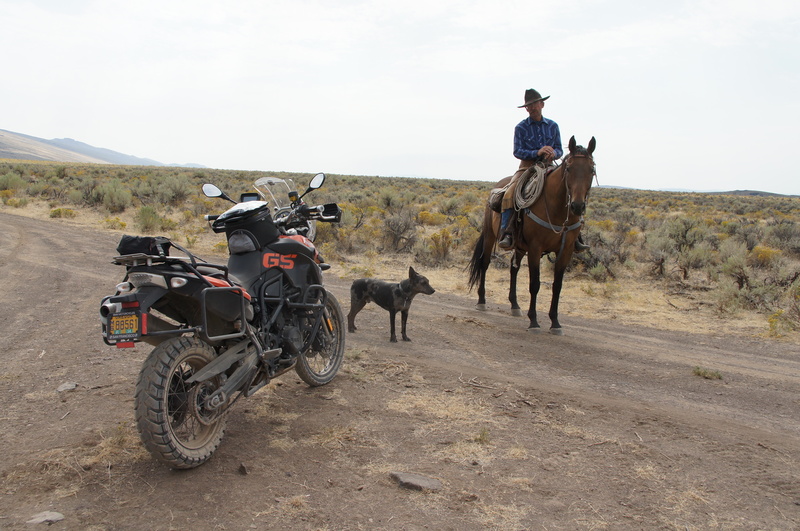 They had found a booth in the restaurant, ordered coffee, and they told me they eventually ordered burgers, and from there never left until it was time to ride back to the ranch in the mid-afternoon. Meanwhile, against everyone’s advise, I ventured on the loop on my own. And I had a great time. The 2010 edition turned to be better than the 2006 edition. For one thing, I was on my own and you know, I’ve talked about this on several posts already, I like riding on my own. For another, it happened that I was right, or I was simply lucky, because all that rain did not turn dirt into mud. There were no signs of flash flood anywhere. Perhaps if it were in June, I would have backed out of it. Leaving Hawks Valley, 2010 Edition of the Lone Mt. Loop. 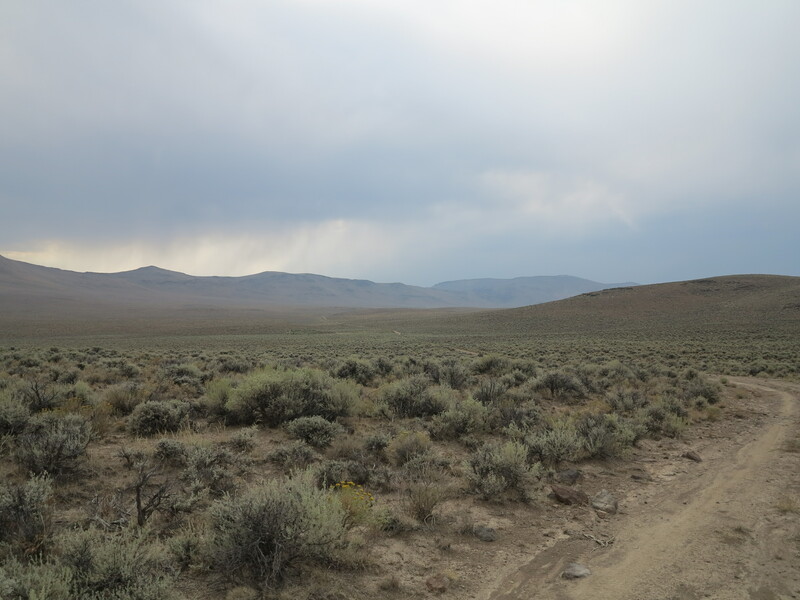 It could had gotten sketchy, I admit, and it rained again when I was on a very desolate area of the loop, in the Hawks Valley area. But it did not turn to mud on those mostly sandy soils. Below is a video when I traveled through those puddles you see on the picture above. As you can see in the video, there are signs of water having run over the road, but aside from the puddles, there were no problems whatsoever riding these roads, no rivers of water to turn into a flash flood. Maybe it needs to rain a lot more to trigger flash floods? In the end, riding in the post rain on these roads was just bonus fun. And you can see also in the video, how sun and clouds alternated. It only served to enhance the beauty of the area. The clouds framed the views, the rain brought color to the vegetation. My one and only regret was not to have a better camera at that time. The clay soil areas, yes they could possibly get slippery, but even those areas were really good, and there are very few and short patches of clay soil in this loop. All together clay soil areas do not make more than five miles, I would say, on this entire loop. Bottom line, no traction problems at all. 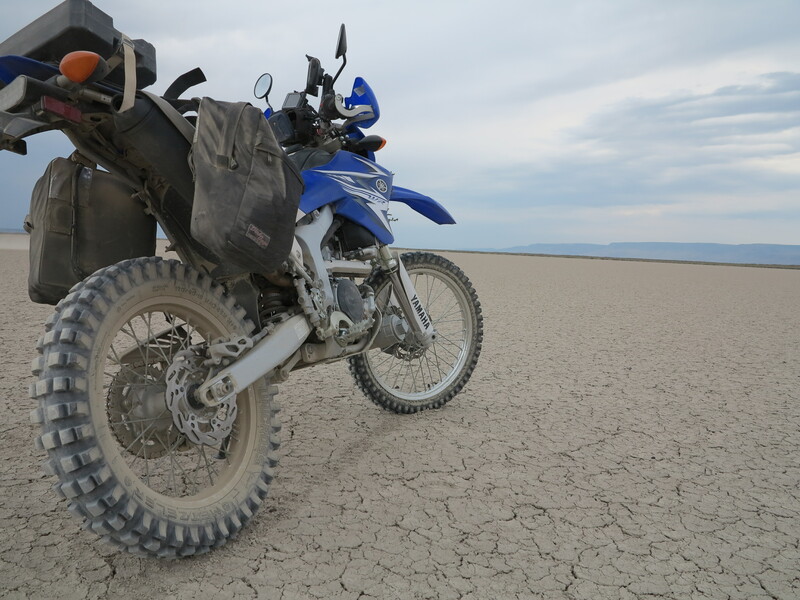 I can say that because of the rain that ride was actually in the best conditions you can possibly imagine for dirt riding: just enough wetness to firm up the soil for great traction and no dust. The worst part of the loop… let me re-phrase that, the only muddy part of the loop, and only muddy enough to make the bike look good, was at the very end of the loop, close to where Catlow Valley connects back to the paved Hwy 205. But it was not slippery and it was not deep mud, just surface mud with plenty of gravel to keep things going. When Doug saw my pictures and videos from that ride in 2010 he understood what I had been talking about when I mentioned the Lone Mt. Loop. 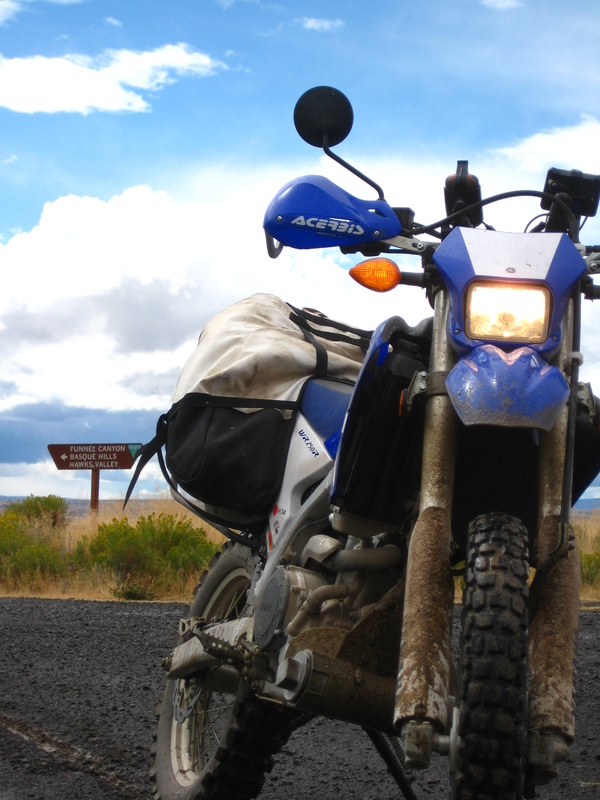 Now, 2013, we are back at the Steens Mountain area and he wants to ride it. Excellent! 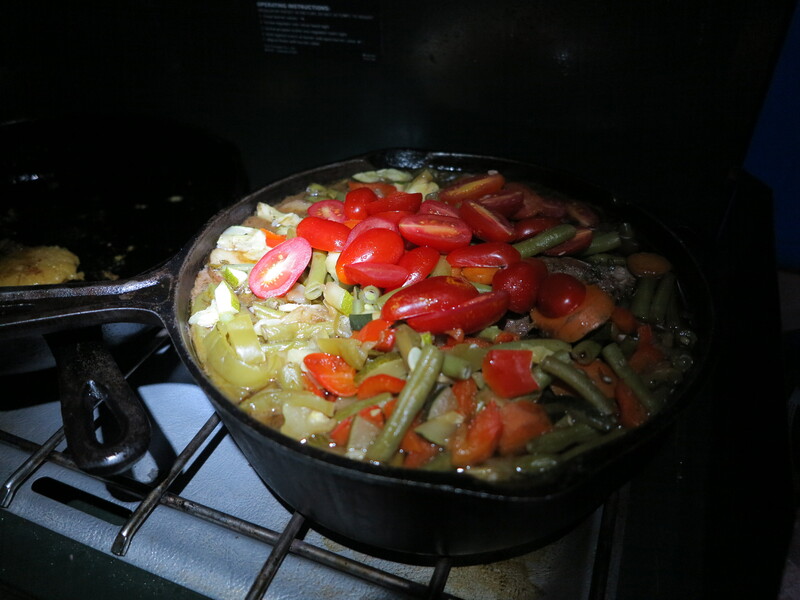 After this long introduction we are finally back on track with the story, back to September 2013, when we were back at the Steens… Annie had prepared another great breakfast. She was going to stay in the campground area, do some hiking, and work on her painting. 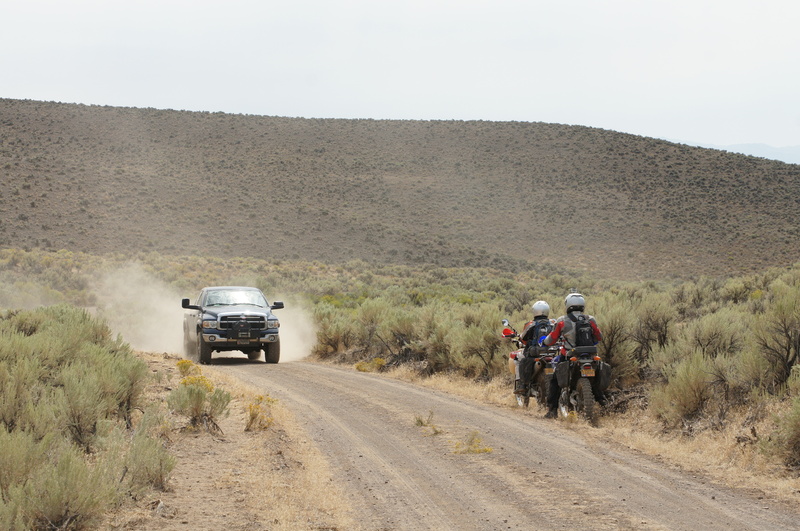 And the guys took off towards Fields for the start of the Lone Mountain Loop. From Fields it is a short jaunt to the Domingo Pass. Chris and Doug ready to start the Lone Mountain Loop, 2013. The first destination: climb the Pueblo Mountains via the Domingo Pass and reach the Rincon Flat on the other side. The climb will give you an opportunity to work on a few switchbacks. Similar to riding technical roads, like we did the day before (previous post), switchbacks are also fun, but it is not a road characteristic that enthuses me. I did not elect this loop as may favorite loop because of roads with technical areas and switchbacks. I see technical areas as something I have to endure to see the views from the top and to get to where, for me, the real fun starts, on the other side of the Pueblo Mountains. The west side of the summit affords you the view of the south side of the loop. 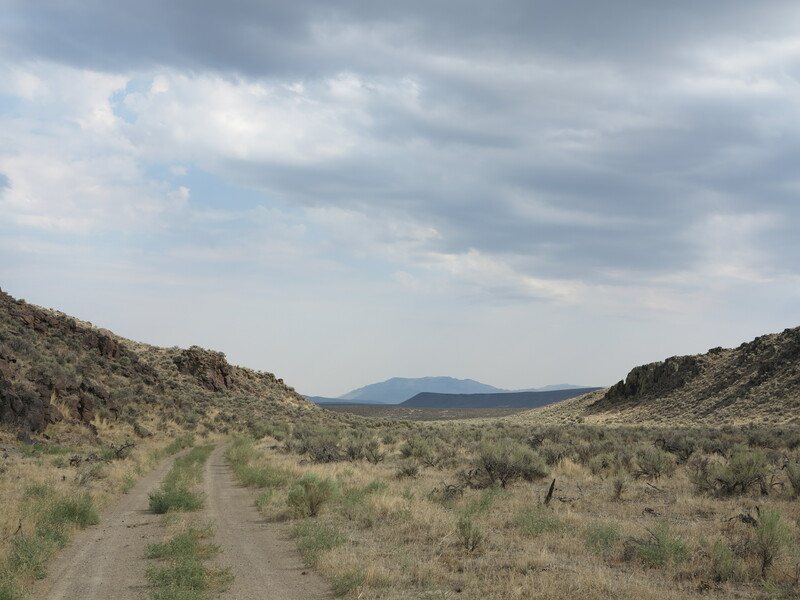 Once we go down the Pueblo Mountains we reach the Rincon Flat, we make a left on that road (I’m not sure what is the name of that road, let’s call it Rincon Flat Rd) and travel south towards Nevada. 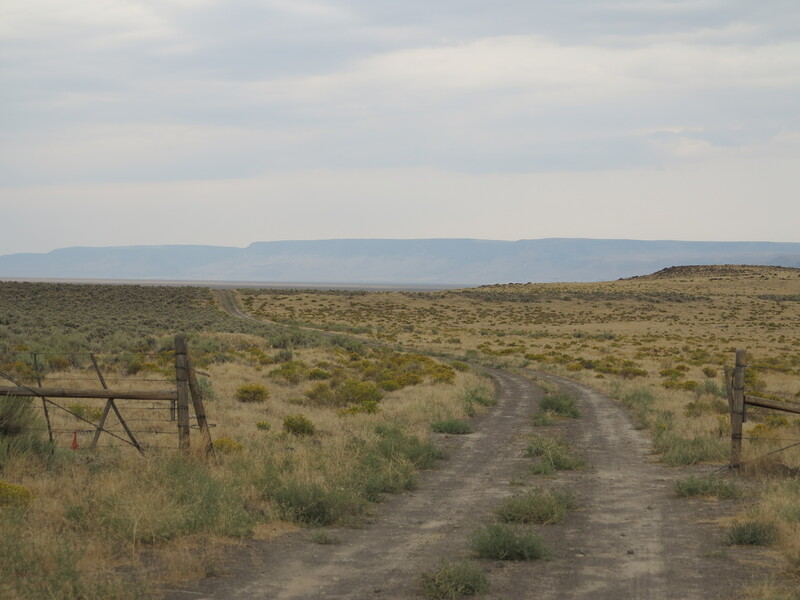 In the Rincon Flat, that’s when Chris met the cowboy, the guy I included in the story, two posts ago, as the “Steens Gaucho”. This is the first fun road of the many fun roads that make this loop really great and y favorite. 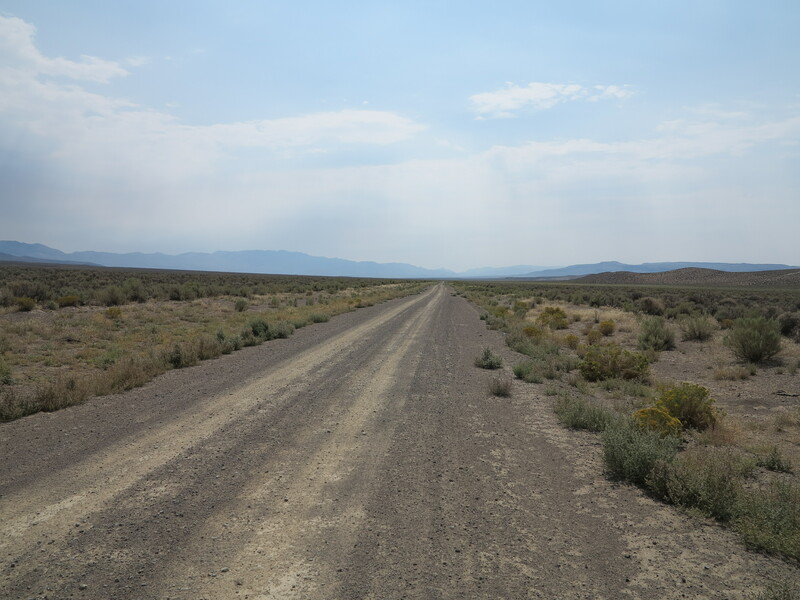 This road goes all the way to Nevada, which is actually no too far, perhaps a couple of miles, from where the loop gets to its southernmost point and turns west to then start the north track, my favorite part of the loop, the sequence of roads and valleys I described earlier. The views are really good. 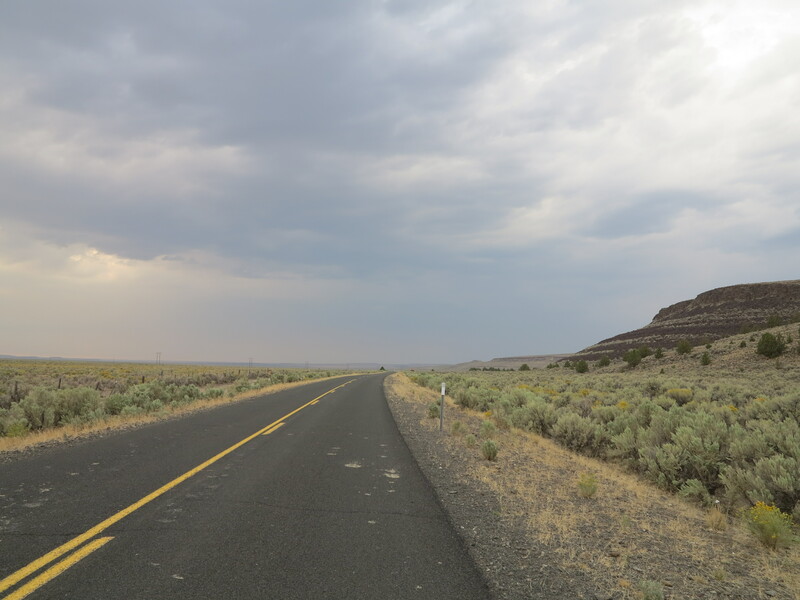 And one of the key characteristics that make these roads great, and why they are part of my favorite loop, is that you can see the road ahead, miles ahead. At some point we noticed dust ahead, a vehicle was coming towards us. It gave us plenty of time to find a spot on the side of the road to provide safe passage for the vehicle. Not something you can safely do on forest roads, where you ride at slower speeds since most of the time there is no clear view of the road ahead. It is also my favorite set of roads because although most of them have gravel, it only has enough gravel to make things interesting. Overall, it is a good road to ride fast. And, my friends, this is what I mean by not being a technical road. 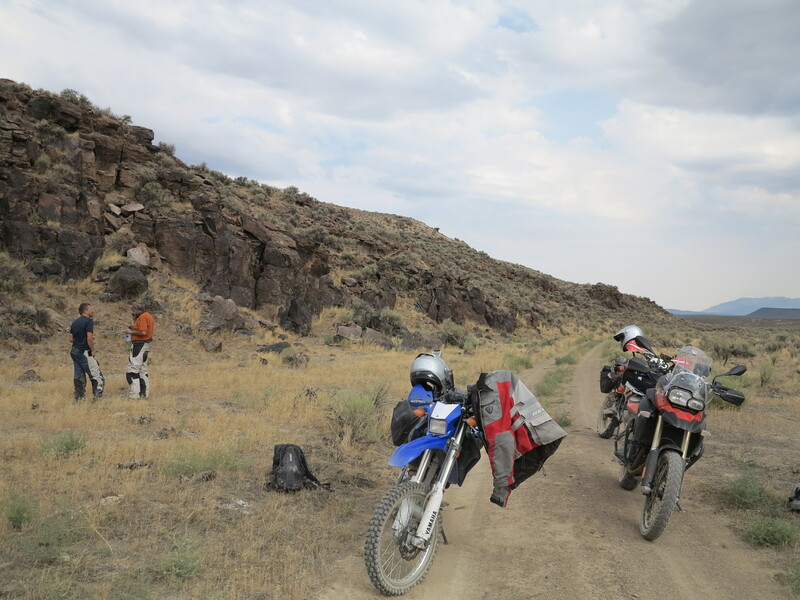 On the so called technical roads you have to slow down for rocks, switchbacks, ruts (actually some people don’t slow down for that, but I do). Add to this equation the fact that you can see through the apex of the curves, and you can see far ahead where the road goes next. This is a formula that allows you to ride with abandon. The Rincon Flat Road is not yet my best road on this loop. But it is close enough and it is representative of what I particularly like about riding a motorcycle in the dirt: dirt roads where you can ride fast, well, not too fast, but on a good pace, where you slide tires, some with the front and more with the back, just enough to make it interesting. On the video below, I’m chasing Doug and his Husqvarna 610 on this road. 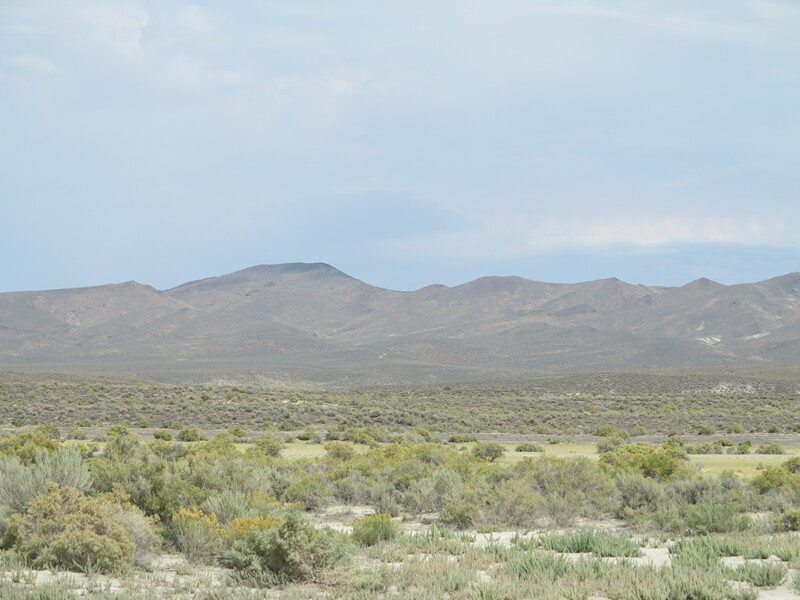 As we approach the Nevada border the road becomes a dirt highway, smooth and straight, all the way into Nevada. If you like dirt highways, the loop includes this little stretch of speed for you, part of the diversity of roads included in this loop. This is the further south point of the loop. I turn right here, a short cut to reach Long Draw and from there start going north. The point we turn west, for the most desolate areas of the loop. Lone Mt. Loop. 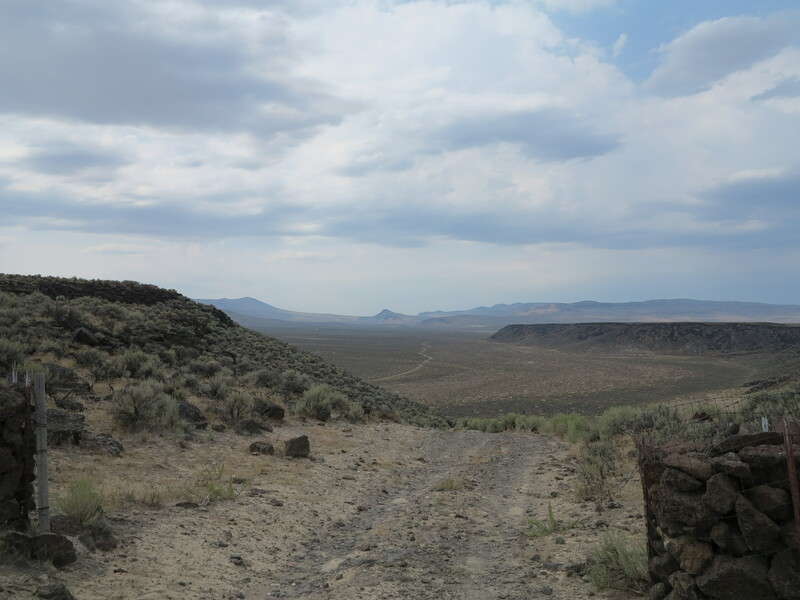 This time around, instead of turning here, we had decided to continue south and explore the Bog Hot springs in Nevada and later check the southern area of the Pueblo Mountains, back in Oregon. 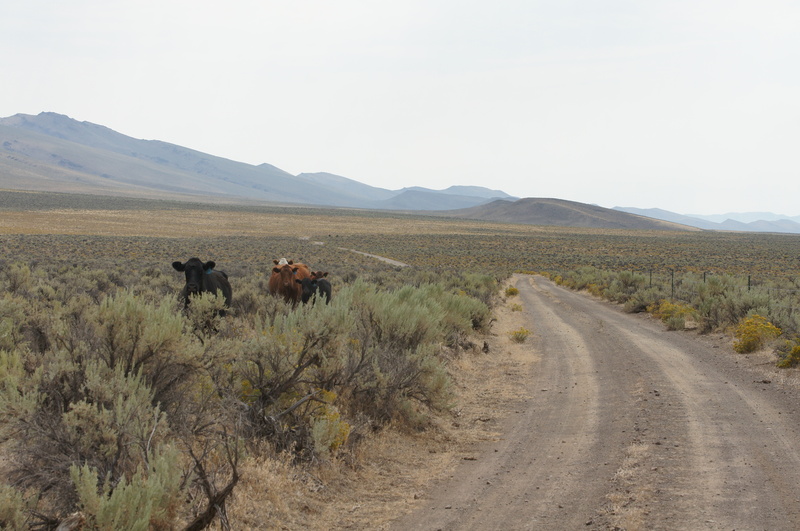 So we continued south on the dirt highway towards the hot springs. 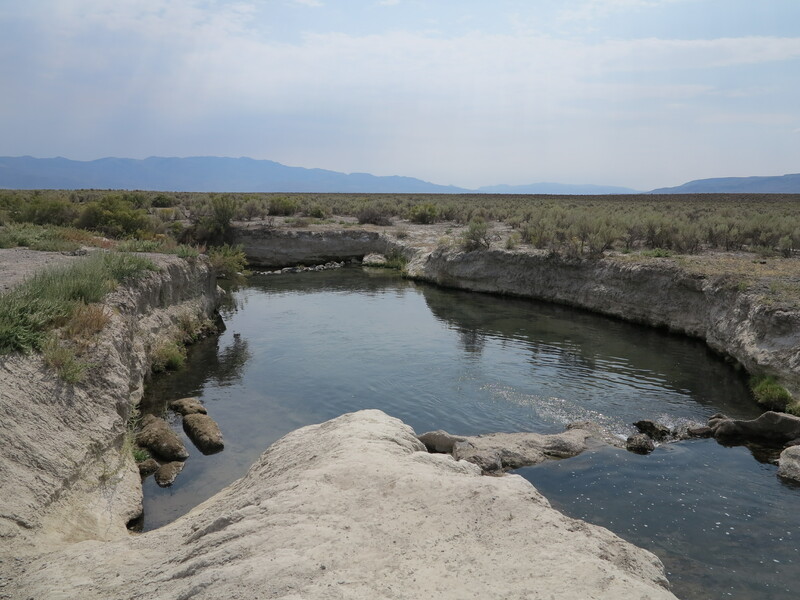 We got to the Bog Hot springs, but the water was too hot to get in. We were lucky about that, because soon after we checked the water, someone arrived and mentioned to us the red spider mites were in full swing. So we turned our attention to the Pueblo Mountains. The plan was to find our way to the remains of the B-24 “Liberator” that crashed in the Pueblo Mountains in February 9, 1945. We had the coordinates and found a road that would take us in the general direction of the crash site. Although this road looks smooth on photos, it is not quite the case at all times. 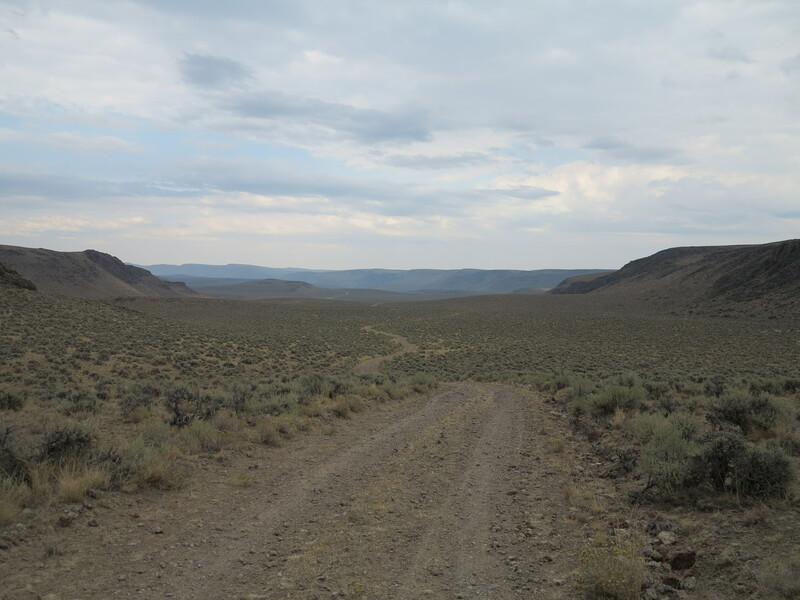 It has some sandy spots, some dry creeks to be crossed, and in general things get worst as the road reaches the steeper parts of the mountain. Eventually the BMW found its way to a rut. What you can’t see on this photo is how steep and highly off-camber this stretch of road is, especially just before the area where the BMW went off. Chris lost momentum on the off camber area, and as he got some gas to climb it, the BMW slid into the rut. Doug was farther ahead, it took a while for him to realize we were not behind him and return to find us. The duty to get this bike out of the rut fell on Chris and I. And it was quite the effort. It gives you a clear perspective, it is not a good idea for someone to ride a bigger bike on his/her own on remote areas. It probably could had been done, one person alone could have possibly extricated the bike from the rut, but it would have taken time, ingenuity and effort to get this bike from that rut by one person. Anyway, Doug gets back to us when we are done and reports the road gets worst up ahead. We quickly decided to turn around and try it some other day, next year perhaps, and perhaps via another route we had heard about. Back to the Rincon Flat area. Bog Reservoir ahead. By this time we had accumulated two failed attempts: the Bog Hot springs and the Pueblo Mountains. 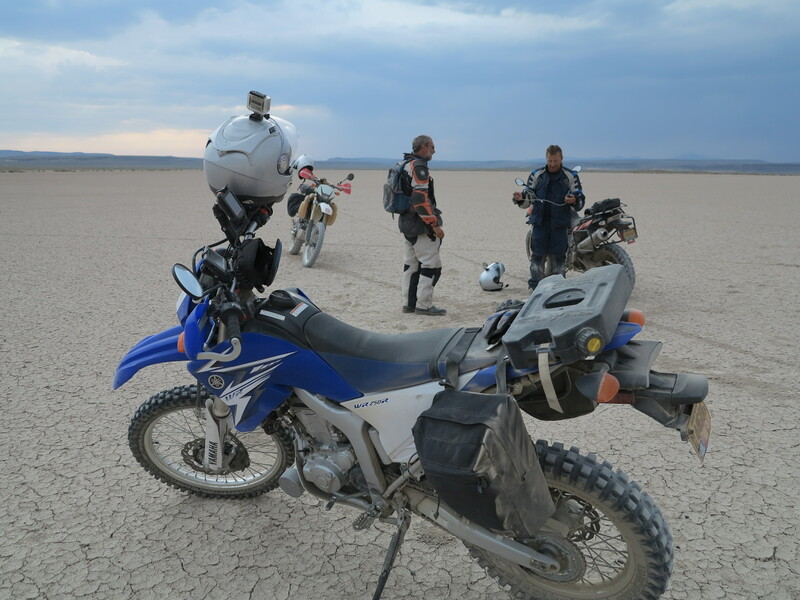 That is adventure riding, you go and try places until you find the limit, then you turn around, if not, you continue on and conquer new territories and adventures for you and your motorcycle. 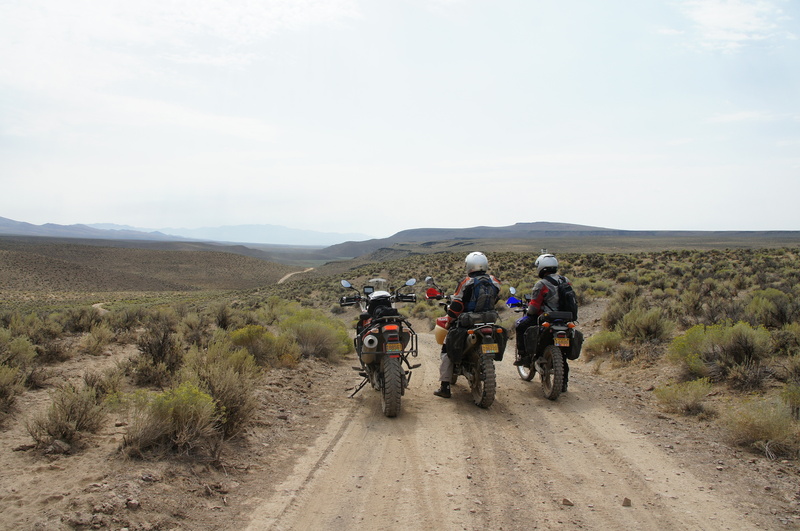 Adventure riding is also about the experience of enjoying that one favorite set of dirt roads. With these thoughts in mind we got back north to find the Lone Mountain Loop. We turned left on the short cut between the Rincon Flat Road and the Long Draw Road. All roads are fun, this short cut is really good as well, another opportunity for the WR250R to have fun with the Husqvarna. And we then arrive at my favorite spot on this entire loop. This is the view of my favorite stretch of road in this loop. First of all, isn’t this a beautiful view? You could say it is comparable to some exotic far away places in our planet. And to think it is not too far from my by home base. Second, check this road there. This road is my riding nirvana. Do you see that sequence of “s” curves way back in the distance where yo can barely see the road, where it intersects the direction to which the mountain chain on the right points? That is just one of the nice features of this road. When riding this road all my senses are concentrated in the moment. This road is a true meditation enabler. The video tells me it took me about 5 minutes to cross the visible part of the road in the photo below. But it could as well had taken me 30 minutes, I would not have known. I like this road because there is no ditch on left or right, no surprise rocks hidden behind a blind curve, nothing that interferes with the ride. 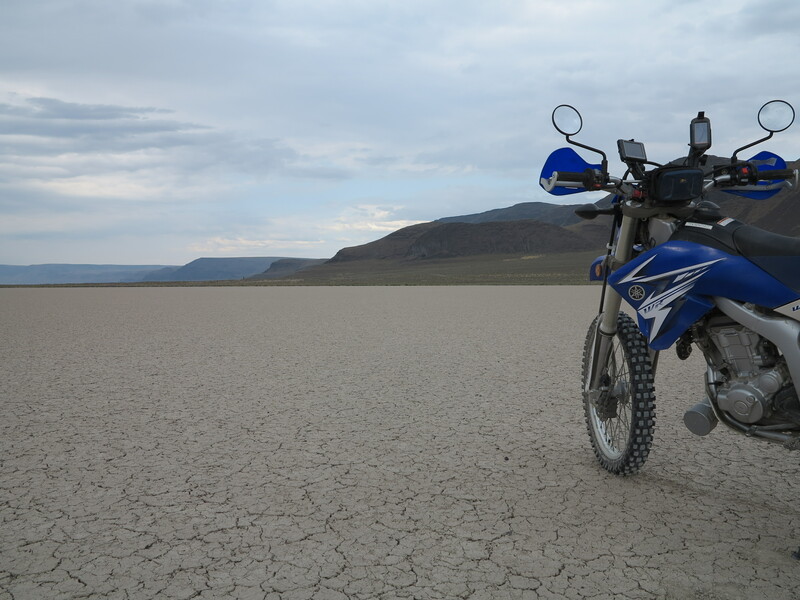 It is the bike, the road, lots of dirt, and your courage to go as fast as you dare ride. I ride this road with abandon. But I did not ride it as fast as I probably can. I mean, I’m sure the bike can go faster with a better rider. One of the evidences of it is that I used the brakes only twice on this entire stretch. One time the rear brake, one time the front brake. I was far from reaching the bike’s limit, but to me, it was as fast as I could go. 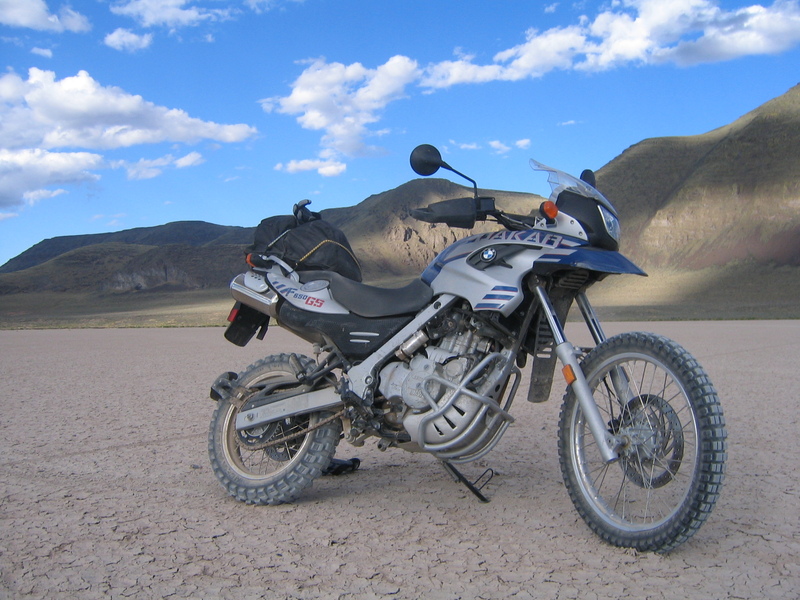 If I were riding an 800cc bike, my Tiger or that F800GS, I would be even farther from the bike’s limits. And perhaps slower overall, I don’t know. But it is something that I want to try some day. And perhaps I would do the whole thing second gear on these bigger bikes, instead of my spread of 2nd, 3rd, and 4th gears. There it is, my favorite road! When riding this stretch of road, all I have in my mind is what gear, what speed, how tight is the next curve, how much are the wheels sliding. Talking about slides, unfortunately the video only capture the bigger slides, like on minute 4:08 when the front end tries to wash out, too much yaw, as Keith Code would say. But the bike was sliding a lot, not too much, just that subtle slide, enough to make things interesting. At times I could feel the front wheel going, and then rolling on the throttle the rear would catch up, barely slide, just enough to settle the front. I can’t tire of that gradual, minimal sliding process that some roads “give” you. 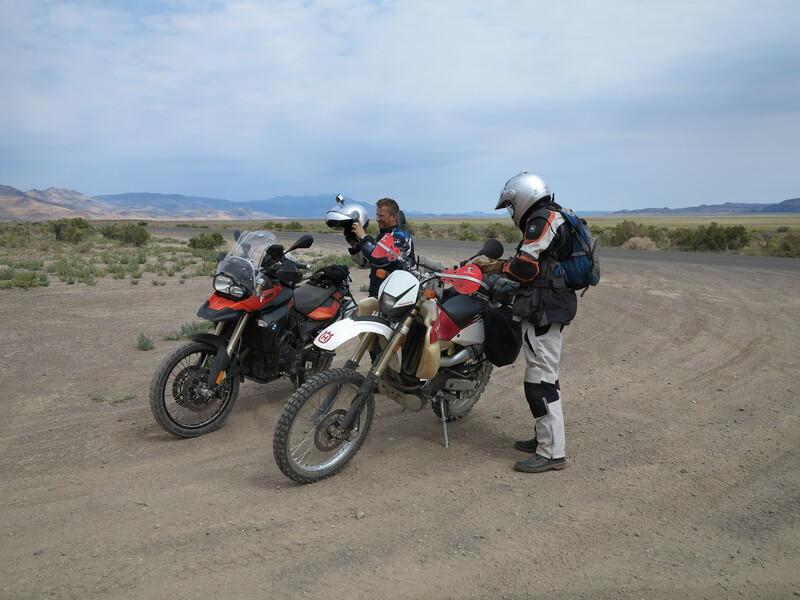 Gradual sliding is something that makes dirt riding really easy compared to paved rides: on dirt you can more easily recover from something that would probably terminal for keeping rubber side down on paved roads. 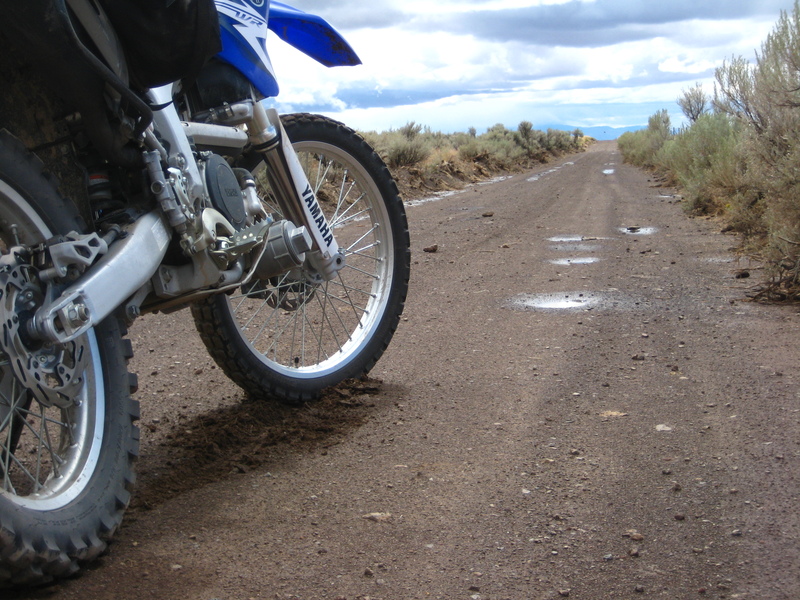 On dirt, the bike recovers easily, in my view, because the start and end of the slides are gradual. I know it sounds contrary to conventional wisdom, but I can’t see it differently. First of all, on dirt most of us are riding slower than on pavement, and we are using a lot less lean. Now couple that with how things happen more gradually on dirt, with plenty of signalling and more obvious feedback. 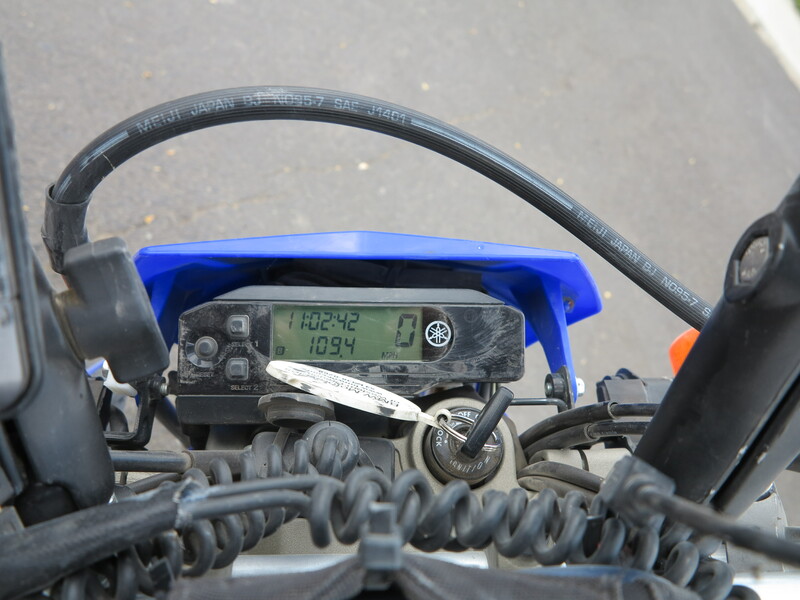 The bike tells you what is going on before it is too late. All of that, in my opinion, is what I perceive as being easier to ride on the limit on dirt. On pavement, when things go wrong, you won’t know until it is too late, things go wrong really fast! You need to be really good and fast on your reactions to recover from a front slide on pavement, for example. And a slide on the rear wheel, on pavement, can result on a nasty high side. Ask me how I painfully know. Something that has never happened on dirt with me. 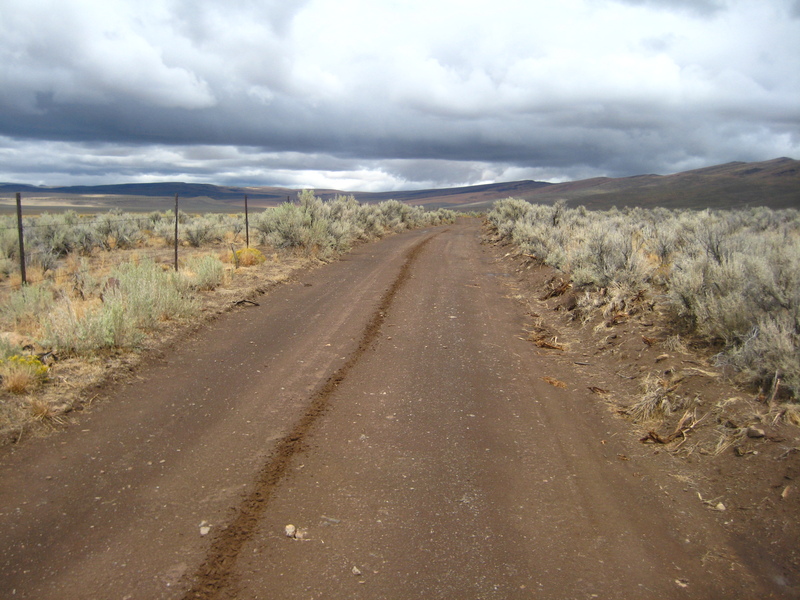 Back to my favorite dirt road, I will hit the “s” curves on minute 1:12 on this video. I will scale up the speed on minute 2:00. I will get distracted on minute 4:55 and almost run out of road (you will see when I quickly check something on the left and that one split second takes my concentration away from the road). 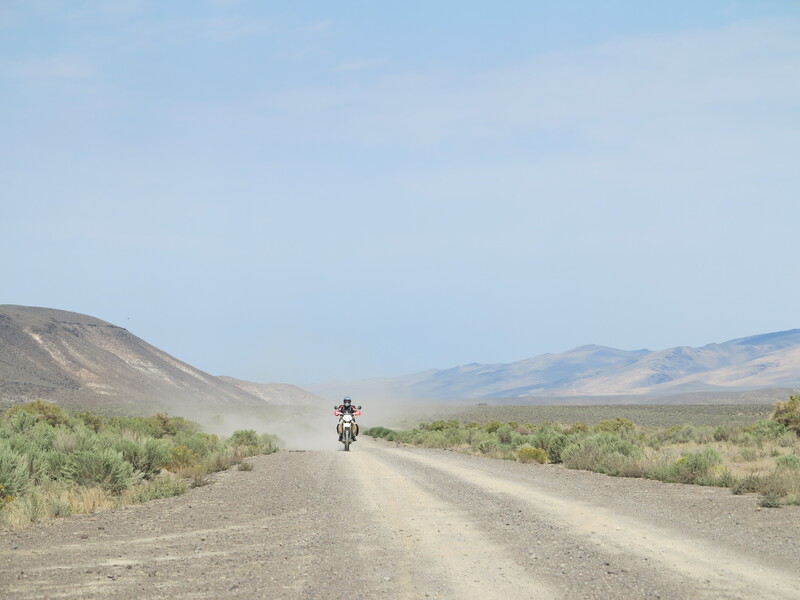 I can only try to imagine what goes in the mind of riders at the Dakar or the Baja races, day after day of full concentration and speed, perhaps they travel at double my speeds. But to me, these 5 minutes were my Baja and Dakar race combined into one. On most of this stretch of road, in these five minutes of video, I’m on 3rd gear. I start the video when I’m on 2nd gear. At some points on this video you can see I want to go back to 2nd gear, to get more engine braking, but 2nd gear proves to be too low for the speeds I’m riding, so I have to quickly get back to 3rd. I also hit 4th gear in some of the straight areas of this stretch of road. If you don’t like seeing videos like this as a rule, at least try to see this one. Maybe you can, by watching this video, understand my perception of what makes this road so nice. Right after this spirited ride I stopped to wait for Doug and Chris, and we decided to have lunch on that very spot I had stopped, right after the fun stretch of road. For me, from now on everything else on this loop is just bonus. I’ve accomplished my goal, to ride my favorite stretch of road. The landscapes get better and better from this point forward, though. 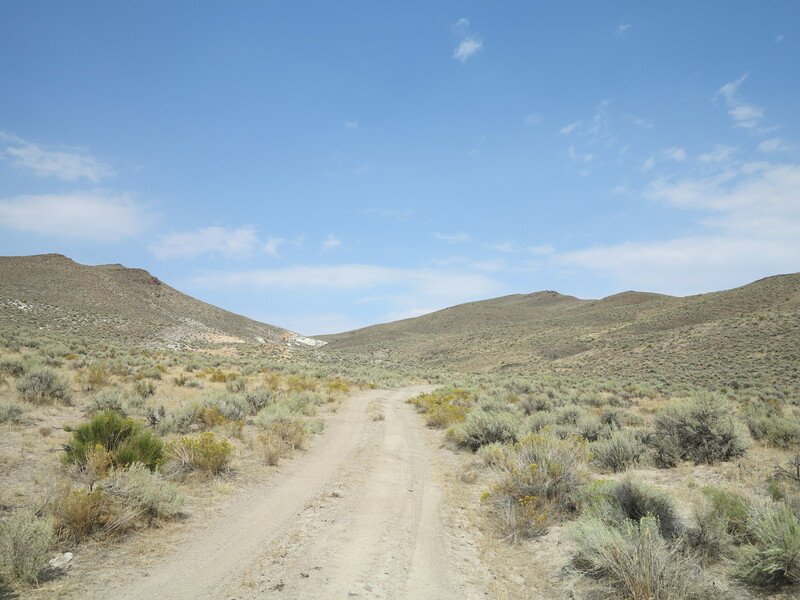 We continued on the Long Draw road, where we hit the more mountainous areas of this road as we ride the narrower valley formed by the Lone Mountain to the right and Lone Juniper and Hawks mountains on the left. 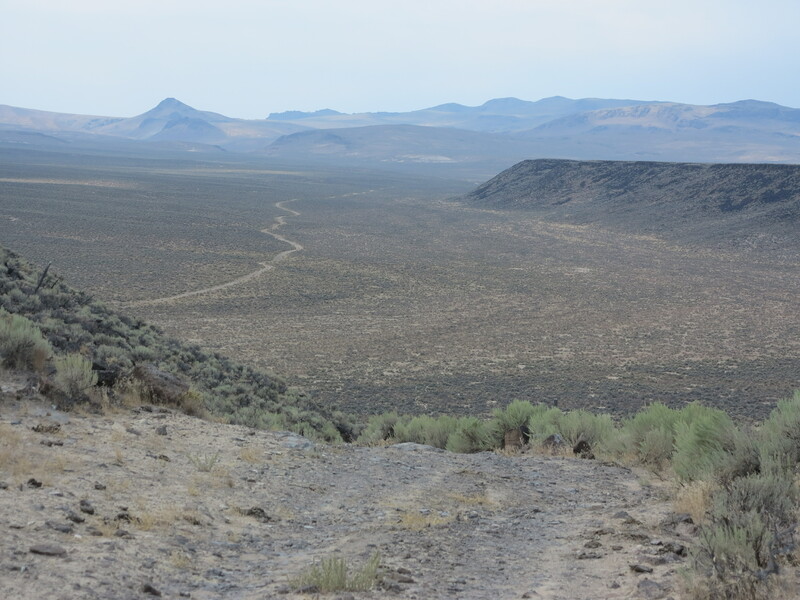 Below is a photo looking back to the Long Draw road, as we climb towards the end of it. The WR250R, a valiant bike and a sample of the terrain it conquers so easily. We arrived at the Hawks Valley, yet we encounter more beautiful landscapes and more nice roads. Each time I go past the Hawks Valley sign it seems to be more difficult to read it. 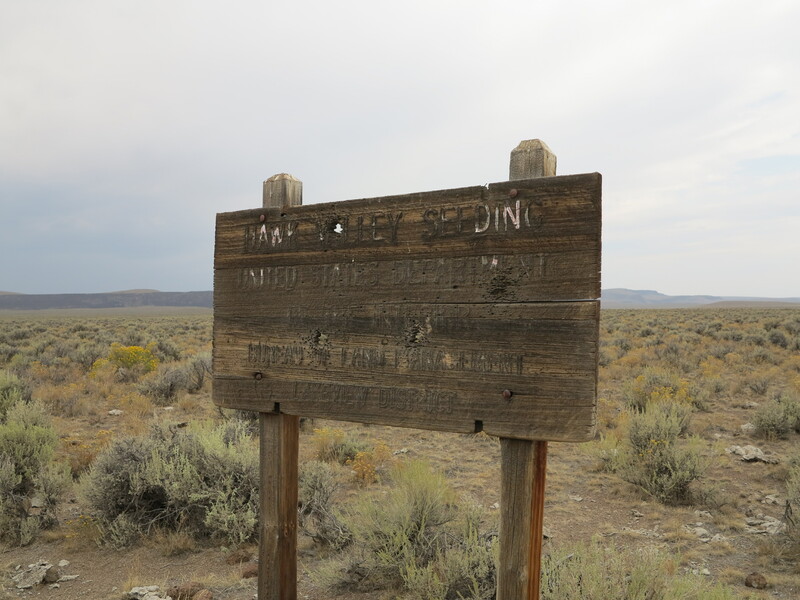 It reads: Hawk Valley Seeding, United States Department of the Interior, Bureau of Land Management, Lakeview District. 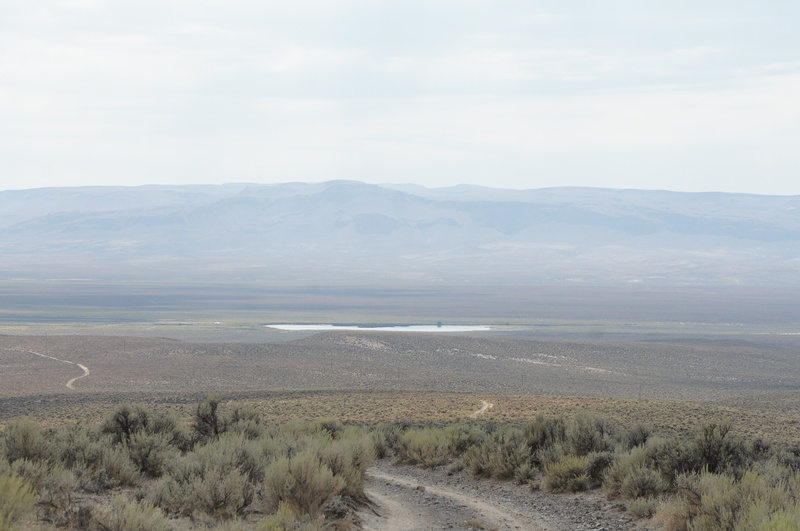 We continued on Hawks Valley for a few more miles (by the way, the Oregon Benchmark Maps and other Atlases indicate it as Hawks Valley. The sign indicates it as Hawk Valley). 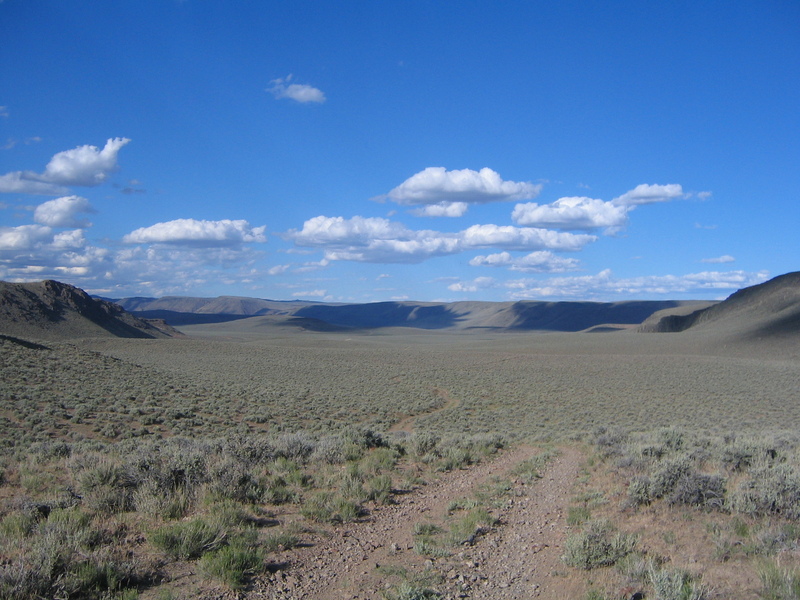 From the Hawks valley we connect with the Funnel Canyon, with the Catlow Rim mountains on the right. What can I say, the photos tell a better story about how nice this area of the state is than I can describe in words. The valley gets narrower, as the road approaches the point when the two sets of mountains get closer to each other, like if you are riding into a funnel. No wonder that’s what they call this canyon. And on the other side, as you go through the funnel you arrive at the Catlow Valley, where things open up substantially. 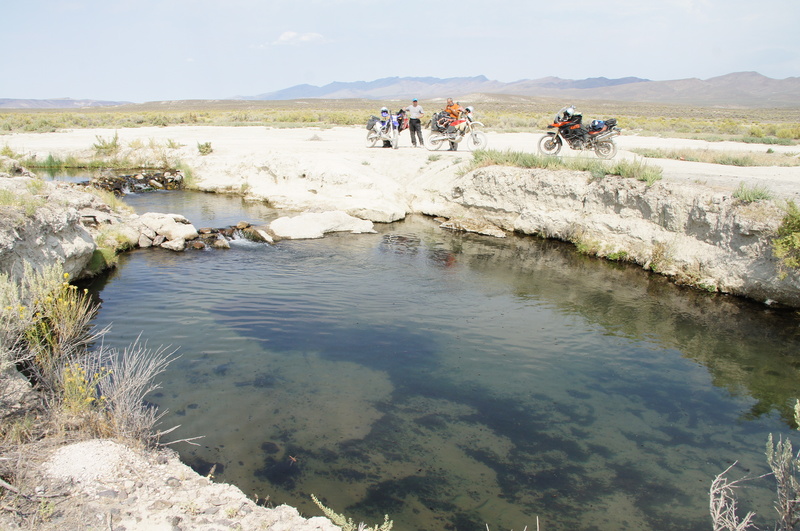 And then we came across the playa, close to the end of the loop, and decided to check it out for some extra fun. Let’s call it the icing on the cake. …while I do a little photo shoot. Great views from all angles. Me and my little bike, mission accomplished. And this was it, one of my favorite sets of roads ever. 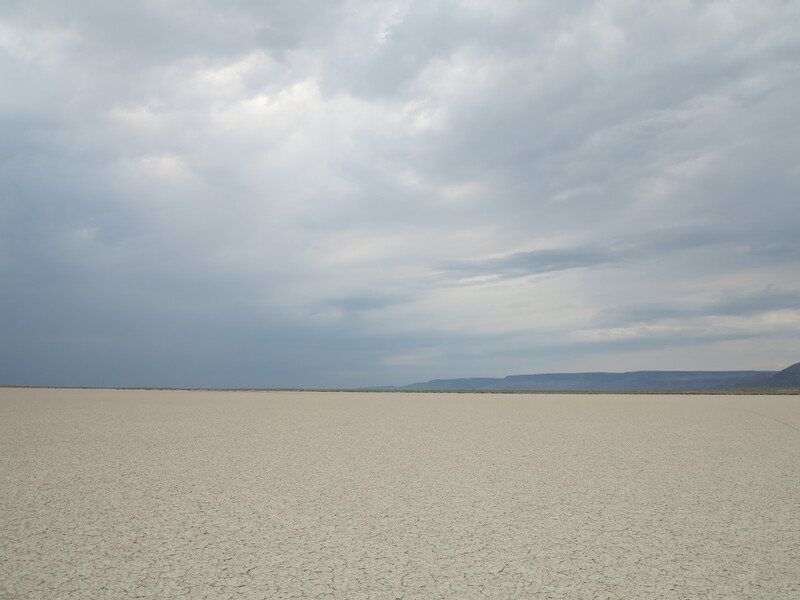 To summarize: dirt, speed, landscape, no trees for long views of the road ahead, big sky, and desolation. These are the characteristics that make this set of roads my favorite roads in the world up to now. I’m looking forward to the roads that will take over from these roads their favorite status. But I know, no matter what, this particular set of roads will remain as one of my favorite riding places in the world. It is a long list that I have, and I plan to continue to add nice roads to it. I had ridden 109 miles to complete the loop from Fields to Fields. 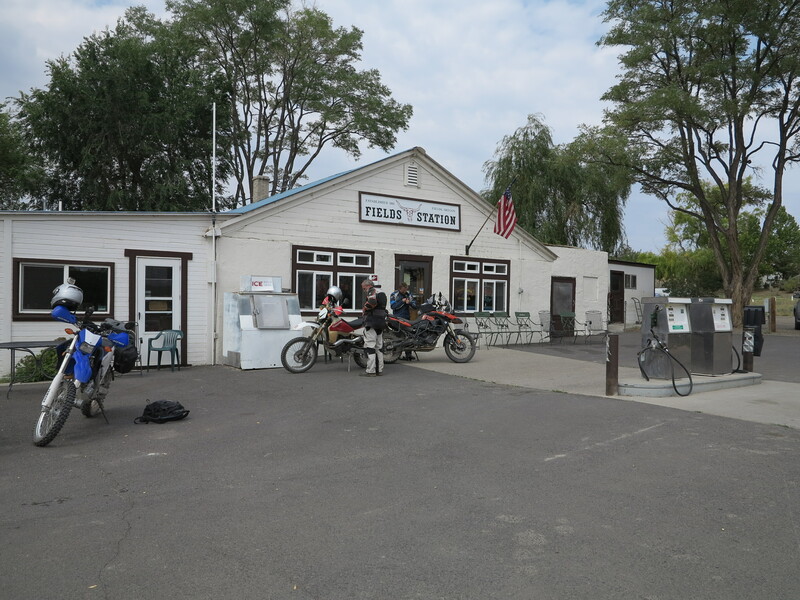 We went down to the Fields Station to refuel the bikes. Family, friends and the staff of the Fields Station were hanging out, enjoying the end of a nice day. We traveled the last 55 miles back to camp on Hwy 205 under the beautiful light of the magic hour of the day. Another great dinner. Thank you again Annie! 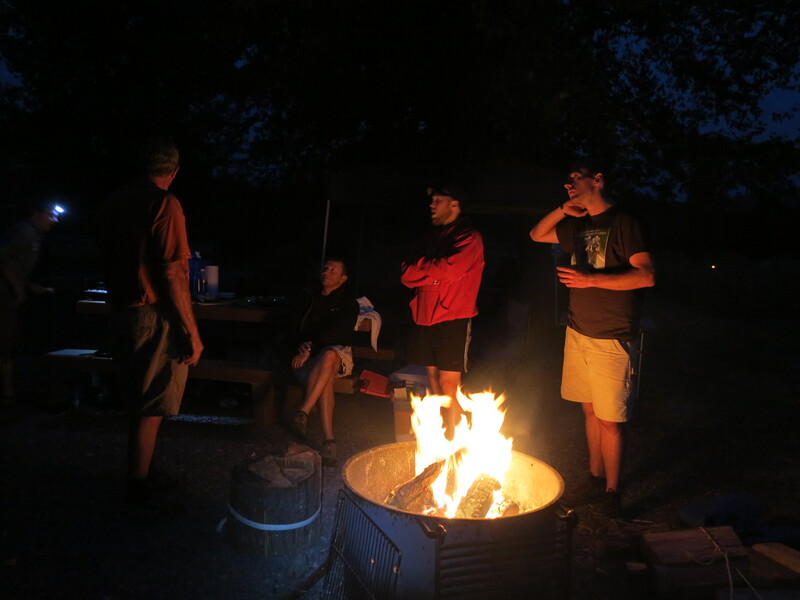 This time our campsite had gathered Kyle and his friend Jared. One more reason, actually two more reasons for larger stories around the fire, and more shots of whiskey. The end of another great day of riding, friendship, and food! I’m thankful for that. About 200 miles in total, that was a super great day, when I had the chance to ride my favorite road with great friends and then had a chance to celebrate with them at the end of the ride. I’m already thinking about the next time I will ride these roads again. Next day we woke up to rain and Doug had his rain-fears surface again. Nothing like having a great Plan B, and with that, we started our return to Eugene. All of that and more on the next post! 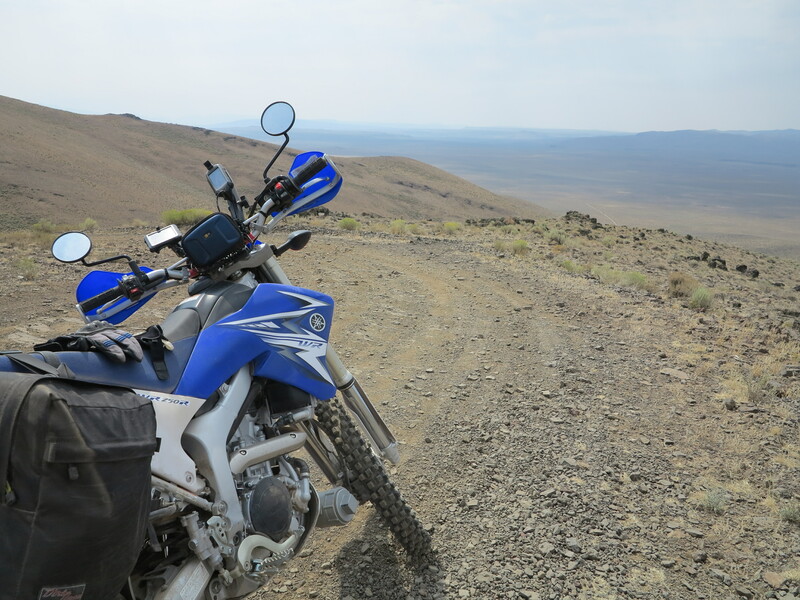 This entry was posted in Riding the Yamaha and tagged Lone Mountain Loop, Steens Mountain Area, WR250R. Bookmark the permalink.